A fresh new approach to advertising that can capture demographics who may otherwise miss out on your ads. Mobile advertising is an essential for any business owner who wants to make their mark. With mobile usage coming close to overtaking standard desktop internet usage, advertising in this format offers you a route directly to those customers who may otherwise miss banner and billboard ads. Tailor your ads to display to a specific demographic, helping to increase engagement from the people most likely to use your business, helping to target your message to potential customers who can drive future sales. We produce a range of advertising options that are optimised for mobile viewing to help drive sales and engagement with your brand and increase your online presence. We will help you target your ads to a specific demographic that you wish to see engaging with your company, which will help to drive sales from key users. Use geolocating to further narrow users and increase the likelihood of future sales from profitable potential customers. We can find you the perfect websites and apps that connect with your core brand values and give you access to a wider audience. Strategize with you to ensure your mobile ad campaigns deliver the returns that your business needs in order to grow. We specialize in a customized approach that is tailored directly to your business needs. 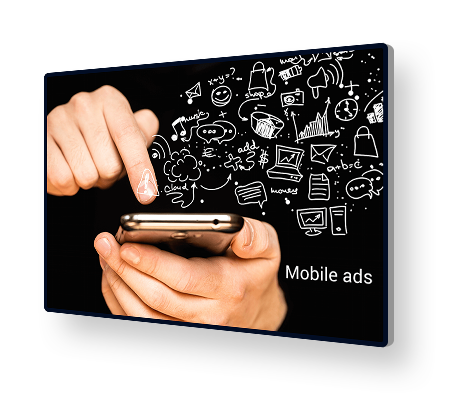 We’ll work with you to understand what you expect to receive from a mobile ad campaign. We will look to optimise premium ad placement to ensure the best ROI and give you access to customers who are most likely to be interested in your business. We’ll consider every aspect of your campaign and help to deliver genuine results to boost your business. In short, we’ll find out everything you need to do, then help you do it. Mobile advertising can be more cost-effective than traditional forms, helping you to manage your budget more efficiently. Beam your ads directly into the mobile phones of high-value users to help drive custom and sales in in your business. We can produce and implement ads into your business’ app that appear naturally and are more likely to receive customer engagement. We will help you with mobile video ads, which traditionally receive the highest viewer interaction of all forms of mobile advertising. Simple, effective, attractive banner ads to help catch the eye of potential customers when they are browsing online. Ads that engage with the user directly and help to stir intrigue and increase engagement and sales thanks to their unique presentation.